Saint Theodore was born in 1774 in a village near Constantinople. He was apprenticed to a Christian painter employed in the palace of Sultan Selim (1788-1807); but despite a pious upbringing, in which he had been attentive to the Holy Scriptures and to prayer, the lure of the pleasures and luxury of the court led him to adhere to Islam. After living for three years in worldliness and frivolity, a dreadful visitation of the plague, which struck all ranks of society including the Sultan's entourage, made Theodore realize the vanity of worldly pleasures. Having come to his right mind, he fled from the palace in disguise and was reconciled to the Church by anointing with Holy Myron. He then took ship to Chios, where he spent some time under the direction of a spiritual father, the renown trainer of neomartyrs, St. Makarios of Corinth (April 17). 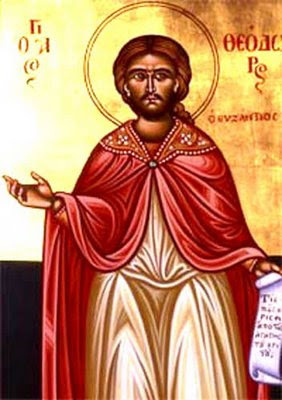 Repeated Confession, reception of the Holy Mysteries, and reading of the feats of New Martyrs like Saint Polydoros (Sept. 13), brought him to the firm decision that he too would seal his repentance by shedding his blood for the Lord. After a difficult battle, he overcame the temptation to abandon this holy resolve and went to the island of Mytilene, accompanied by a zealous brother who had already helped Saint Polydoros. On Thursday of the first week of Great Lent he presented himself dressed as a Muslim before the judge. Boldly confessing his conversion, he tore off his green turban and trampled it underfoot. The judge took him for a fool and committed him to prison in chains, giving the gaolers leave to beat and insult him as they pleased. The following day, after a second court appearance, he was taken back to prison and beaten 300 times on the soles of his feet. His cell door was left open for anyone to come in and beat him. A gang of some fifteen Muslims then set upon the Holy Martyr, who endured their blows without complaint, only saying in a choking voice: "I am a Christian!" Afterwards, they tied two bricks to his temples so tightly with a chord that his eyes were forced from their sockets. As he called with loud cried for help from above, they struck him on the mouth, broke his teeth, and left him half dead. 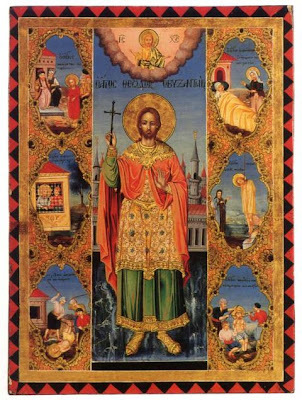 A young Christian named George, an avid reader of the feats of the Holy Martyrs, got himself imprisoned in order to observe Saint Theodore's contests. He stayed at his side, kissing his feet and encouraging him, while the Turks questioned him and subjected him to different torments. When sentence of death was finally delivered, the executioners tore off his fetters with violence and beat him along the way to the place of his execution. Having confessed Christ one last time, he was hanged on the gallows, but the rope broke and he fell to the ground, hurting his legs. He was strung up again, and thus obtained the much longed for crown of martyrdom. For three days Christians hastened there from all parts to take pieces of his tunic, and to soak them in his precious blood, which continued to flow from his wounds, and many were healed of their sicknesses. 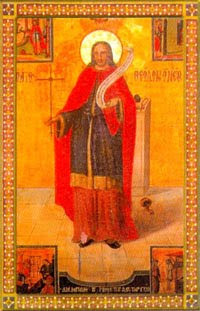 Saint Theodore was solemnly laid to rest, and he is venerated as one of the holy protectors of the island of Mytilene. From The Synaxarion (vol. 3), pp. 542-543. Lord Jesus Christ, the physician of my miserable soul, do not turn from me the sinner in disgust, but strengthen my weak and hardened heart, and warm it in its love for Your martyrdom. I denied You, my Maker and Benefactor, without being forced by anyone and became a servant of the vile devil and a plaything of demons, and found myself under their authority and subject to their will. Now aided by Your grace and unsurpassable forbearance, which has helped me to flee their traps, help me, who am a miserable and pitiful creature, unworthy of the Orthodox Christian calling, to confess You before rulers and tyrants. Yes, my Lord, yes Only-Begotten Son of God. Do not turn in disgust from your servant, but accept me in the choir of your martyrs, and find me worthy to gain their forgiveness. Amen. After the martyrdom of Saint Theodore, the Christians buried him in the southern area of the Chrch of the Panagia Chrysomallousas. In 1798 his sacred relic was translated to a crypt in the Metropolitan Cathedral of Mytilene. This is commemorated on April 30th. 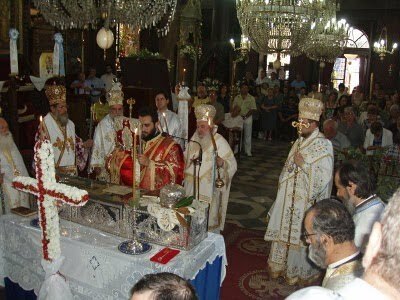 On the fourth Sunday after Pascha, which is the Sunday of the Paralytic, the Church commemorates the miraculous deliverance of Mytilene from the plague of 1832. 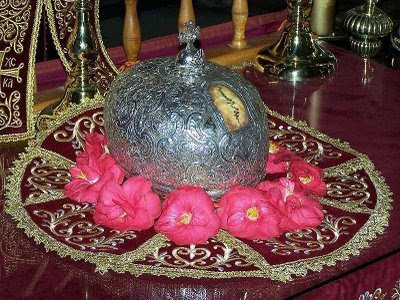 A few blocks from the port in Mytilene town, are enshrined the relics of St. Theodore of Byzantium. On his feast day, February 17th, Orthodox Christians celebrate his memory with flowers and brightly illuminated lanterns in the church bell tower. In 1888, however, when the regions newly assigned pasha asked what the Christians were commemorating and was told about St. Theodore, he became angry and forbade them to display public veneration for the martyr. The next morning the pasha was found dead, and everyone, both Christians and Muslims, believed this to be an act of God, a punishment for forbidding of the celebration. The Metropolitan Cathedral (the new Cathedral) and Sts. Theodoroi (the old Cathedral) are just a few blocks away from the waterfront of Mytilene town. The Metropolitan Cathedral contains the skull of St. Theodore and is open daily. The old Cathedral is a block away, and though officially dedicated to the Annunciation, the locals call it "Agioi Theodori", after Sts. Theodore Stratelates, Theodore the Tiro and Theodore of Byzantium. Thou wast offered to God as a precious gift through thy labours in conflict, and didst become a blameless and acceptable offering. O blessed Theodore we praise thy struggles; we give glory to God who has strengthened thee, O much-afflicted one, against all thine enemies, visible and invisible. Thy contest has arisen like a bright morning star and has inspired us to glorify Christ. He has shown thee forth as one steadfast in struggle, O Martyr Theodore. Let us the faithful praise the pearl of Jesus in odes and hymns, Christ's bright star of the neomartyrs, Theodore the New, the boast of the faithful. The all-precious Relics of St. Theodore, O faithful, let us gloriously honor as a precious treasure, and let all cry out: Save us from the dangers, those who faithfully hymn you, as when you delivered the city from the plague, and preserve all of us through your intercessions.